SAN FRANCISCO, Agusan del Sur, April 15 (PIA) -- The Department of Health – Center for Health Development (DOH-CHD) Caraga, along with other government agencies assured the provision of services and assistance to the drug dependents in the region right after they are rehabilitated in the center. DOH-CHD Caraga Regional Director Dr. Jose Llacuna Jr. gave this assurance in time with the turn-over ceremony of the Drug Treatment and Rehabilitation Center situated in Barangay Alegria, San Francisco town. Dr. Llacuna said, the department is in constant coordination with the provincial government of Agusan del Sur, together with the Technical Education and Skills Development Authority (TESDA), in the implementation and provision of the various programs and services for the drug dependents. There will be free trainings for them to enhance their skills and be employed so they could improve their quality of life. Government agencies would also help those who would like to go back to school and study. Undersecretary Roger Tong-an of the Administration and Finance Management of the DOH also supports this endeavor. “So after their rehab, they will go back to the community, and of course as the governor has said, we would really collaborate with TESDA, Commission on Higher Education for those who would want to be graduates in a vocational or maybe in college degree later on,” said Tong-an. 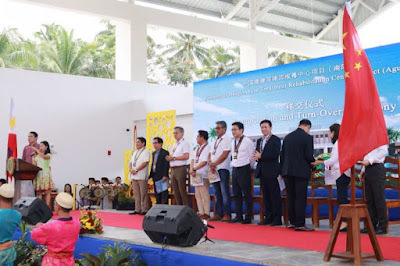 SAN FRANCISCO, Agusan del Sur, April 15 (PIA) - Officials from the People’s Republic of China recently turned over the 150-bed capacity Drug Treatment and Rehabilitation Center worth P370-million to the Department of Health – Center for Health Development (DOH-CHD) Caraga and provincial government of Agusan del Sur. The completed and soon to be operational facility situated in barangay Alegria, San Francisco, Agusan del Sur opens the door of opportunity for the drug-dependent individuals for their rehabilitation and fast recovery. According to DOH-CHD Caraga Regional Director Dr. Jose Llacuna Jr., the donated project was granted through a Memorandum of Understanding signed last March 13, 2017 while the groundbreaking ceremony was held in February 12, 2018. 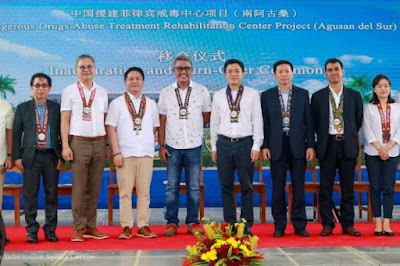 Llacuna said, after the establishment of the first rehabilitation center in barangay Anomar, Surigao City, the government could now provide extensive assistance to the recipients of the second and bigger facility built in Agusan del Sur, which is not only for the Agusanons and Caraganons but also from other neighboring regions. “We are given an MOOE of about P12-million for the initial operation. So, the target will be on August - September for this to become fully-operational,” bared Llacuna. The official also said that victims of illegal drugs for rehabilitation would undergo due process. It is free of charge for those under court order cases. 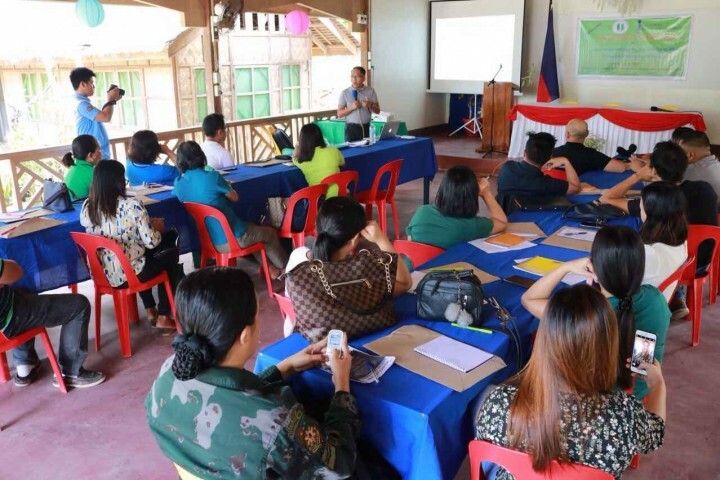 e 27 newly-designated information officers and writers from various offices of the local government unit of Cagwait, Surigao del Sur have undergone training on Newswriting, Feature Writing and Photo Journalism. The said activity was aimed at training and enhancing their skills in writing to effectively disseminate relevant information to the public. Yrica Jie Colongan, Social Welfare Officer I of Municipal Social Welfare and Development Office (MSWDO)-Cagwait, one of the designated information officer and writer of said municipality, expressed her eagerness to learn more especially that it is her first time to join in this kind of training conducted by the Philippine Information Agency (PIA) Caraga. According to her, she has become more confident in doing her functions and responsibilities after gaining the necessary knowledge and techniques. “I’m very excited because right after this training, I would become a contributor to the development of the LGU-Cagwait website. I have learned a lot from this training especially in writing news stories,” said Colongan. Also, Mecifuro Hingpit, staff from the Municipal Environment and Natural Resources Office (MENRO) Cagwait emphasized the significance of learning such training on news writing as it will help them become effective on their function as information officers of their respective offices. “This training conducted by PIA Caraga is really a big help. We had several big events here in our municipality that we were not able to make known to the public because we are not that equipped in writing news and telling our stories to other people. However, now that we are trained, we are confident to write factual and timely news to our constituents,” said Hingpit. During the two-day training, participants actively interacted with the facilitators and submitted their own write-ups focusing on their respective offices’ achievements, programs and services, as well as upcoming activities for critiquing. These are also for posting, not only in the official website of the LGU, but also for PIA and other print media publications. Apart from news and feature writing, they also learned how to capture good quality photos with the right cutlines. Meanwhile, PIA Caraga regional director Abner Caga emphasized that the participants will serve as multipliers of sharing developmental information to the public. BUTUAN CITY, April 15 (PIA) -- With the Philippine National Police’s (PNP) intensified campaign and serious implementation of security measures, particularly in running after the wanted persons in Caraga region, the authorities have apprehended 43 most wanted persons and 497 wanted persons with the implementation of Manhunt Charlie, while some 540 firearms were also confiscated from January 13 to March 29, 2019. The PNP also confiscated and recovered a total of 1,027 firearms from the separate conduct of police operations. During the presentation of accomplishments on simultaneous focused police operations at the PRO13 headquarters held recently, Police Brigadier General Gilberto DC Cruz, PNP Caraga regional director, disclosed that 89 firearms were confiscated during the implementation of the Commission on Elections (COMELEC) gun ban while 938 firearms were turned over to the police units. Based on the record of the regional operations division, 75 gun ban violators were nabbed since the start of the implementation of COMELEC gun ban. It was learned that of the 938 firearms now under police custody, 39 of them were surrendered by political aspirants. Cruz also stressed that the PNP is serious in implementing the laws and is religiously monitoring the peace situation in the region. BUTUAN CITY, April 15 (PIA) -- Various sectors in this city have been pushing for sustainable urban infrastructure projects that will boost the economy and tourism here. 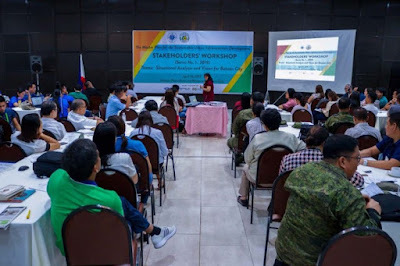 During the recently held Stakeholders’ Workshop on the Master Plan for Sustainable Urban Infrastructure Development (MPSUID) spearheaded by the National Economic and Development Authority (NEDA) Caraga with the presence of environmental planners, economists and engineers, the group assessed the current situation, as well as the issues and concerns of the city that need to be addressed. Michael Tomeldan, environmental planner and team leader architect for MPSUID, stressed the importance of having a master plan since it will serve as a guide in the implementation of different projects for the city. He added that Butuan City was one of the 10 cities chosen by the NEDA central office as pilot area of the respective region to craft a master plan for infra projects. NEDA Caraga Assistant Regional Director Roy Kantuna revealed that this workshop is the first of the four workshops to be conducted this year to complete the master plan. He further emphasized that the NEDA would make sure that the team would come up with quality concepts. “As my personal observation, we’re very happy that stakeholders particularly the industry cluster here and the regional line agencies exerted effort and actively participated. The local government of Butuan City is also full-force,” said Kantuna. LUNGSOD NG BUTUAN, Abril 15 (PIA) - Isinusulong ng ibat-ibang sektor sa Butuan City ang pagkakaroon ng mga proyektong pangkaunlaran na magbibigay ng pangmatagalang pag-unlad sa ekonomiya at turismo sa lungsod. Sa isinagawang Stakeholders’ Workshop on the Master Plan for Sustainable Urban Infrastructre Development (MPSUID) na pinangunahan ng National Economic Development Authority (NEDA) Caraga, kasama ang mga environmental planners, economists at engineers, pinag-aralang mabuti ang kasalukuyang estado ng lungsod at kung anu-ano ang mga isyu at hamon na kinakaharap nito na dapat mabigyang-pansin. Ibinahagi ni Michael Tomeldan, isang environmental planner at team leader architect for MPSUID, na mahalaga ang pagbuo at pagkakaroon ng isang master plan dahil magsisilbi itong gabay sa pagpapatupad ng mga proyekto sa lungsod. Ayon sa kanya, isa ang lungsod ng Butuan sa sampung siyudad na napili ng NEDA central office na maging pilot area ng kani-kanilang rehiyon para pagkakaroon ng master plan sa mga proyektong pangkaunlaran. 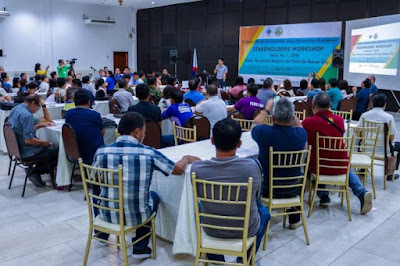 Ayon naman kay assistant regional director Roy Kantuna ng NEDA Caraga, unang workshop palang ito, at magkakaroon pa ng tatlong susunod pa sa taong ito para matapos at mabuo ang master plan. Sinisigurado aniya ng ahensiya na de kalidad ang konseptong mabubuo para dito. “Nagagalak tayong makitang aktibo ang partisipasyon ng mga stakeholders particularly na yung mga industry cluster natin dito at regional line agencies, at full force din ang lokal na pamahalaan ng Butuan City,” pahayag ni Kantuna.